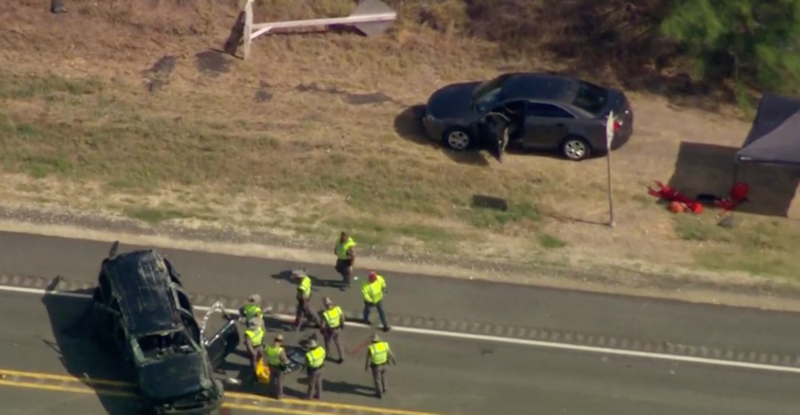 DALLAS -- Authorities say five people have been charged in a "smuggling scheme" following the fatal crash of an SUV that was fleeing Border Patrol agents and sheriff's deputies in South Texas. Federal prosecutors announced the charges Tuesday in connection to the Sunday crash that killed at least five people. They identified those charged as 20-year-old Jorge Luis Monsivais, Jr. of Eagle Pass, 21-year-old Rudy Gomez of Hockley, 19-year-old Johana Gomez of Houston, 55-year-old Marcial Gomez Santana of Mexico and 45-year-old Mariela Reyna of Mexico. Investigators said the vehicle was carrying 14 people and traveling more than 100 mph when it lost control and overturned on Texas Highway 85 near Big Wells. The Border Patrol said two other vehicles were traveling alongside the SUV earlier in the day and the vehicles were conducting a "smuggling event." Prosecutors said Tuesday that 23 immigrants were involved in the smuggling scheme. Twenty-one are Mexican nationals and two are Honduran nationals. They said six of them are being held on federal complaints as material witnesses and Monsivais is in custody of Dimmit County authorities. Amelia Flores, who works as a pediatric nurse, said she watched the SUV zoom past her Sunday, before losing control. "There was a big dust of dirt in the air and as soon as it settled I just saw all of the bodies," Flores told CBS affiliate KENS-TV. Flores said she pulled over and quickly jumped into action, performing CPR and checking the pulses of several victims. The incident comes amid heightened tensions over the treatment of immigrants at the southern U.S. border. The Trump administration has said tougher immigration policies -- even separating children from their parents -- are needed to deter immigrants from coming to the country illegally.